8.1 Where are fakeobs data stored ? 8.2 On which port does fakeobs API listen ? 8.3 On which port are published the package repositories ? 8.4 Where can I find fakeobs projects archives ? Fake OBS is a delivery system which can extract project from an OBS system to export them as a simple tar file for use at a remote site. At the remote site, the delivered project is visible as it would be in the original OBS, but as read only. You can use it for example to build your own project against a fixed release of a public project (Tizen, MeeGo...), without the drawbacks of a slow/unreliable internet connection or unplanned update of the public web site. An other use case is to deliver code to customer in order to allow them to build their additional code on your base project without offering a public OBS. It is delivered from the Mer Delivery System tools and we thank them for their initial contribution. The OBS Light client and OBS Light server appliance integrates a FakeOBS server. That is the simplest way to use FakeOBS: OBS Light client OBS Light server appliance. This version is the old stable version. We recommend you to install the new 1.0.0 version. 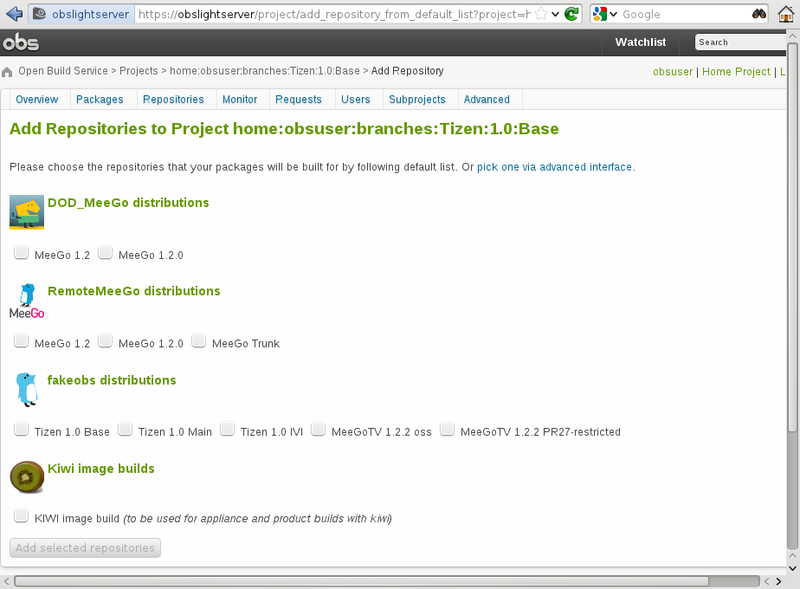 We publish packages for openSUSE 11.4 and 12.1 in the repositories of OBS Light. obslight-fakeobs has dependencies on python-async, python-gitdb and python-smmap which can be installed from openSUSE's devel:languages:python repositories. This version is incompatible with 0.6.x versions and older. But there is a migration procedure. obslight-fakeobs has a dependency on python-cmdln which can be installed from openSUSE's devel:languages:python repositories. zypper  se -t pattern base > /dev/null || echo "No opensuse main repository." All commands except list, check and export must be run as root. The program assumes you run it on the same machine hosting your OBS API. It has been designed to work with our appliance: OBS Light server appliance. Starting from version 0.6 you can use it directly from OBS Light client (>= 0.5.3), without a real OBS server. The name of the project is contained in the archive. If you run this command on an OBS appliance, a project link with name "fakeobs" is automatically created, and the fakeobs project you are importing is added as a pre-configured build target. The URL of the OBS public API you want to get project from. Example: "https://api.tizen.org/public". The rsync URL of the root of package repositories. Example: "rsync://download.tizen.org/live". The full name of the project. Example: "Tizen:1.0:Base". Optional: The name of the repository target. Example: "standard". Optional: A list of architectures to grab. Examples: i586, x86_64, armv7el. If you don't specify repository targets or architectures, all available will be downloaded. obslight-fakeobs grab -A "https://api.tizen.org/public" -r "rsync://download.tizen.org/live" -t standard -a i586 -a armv7el "Tizen:1.0:Base"
This will take some time, depending on your internet connection. After that, the project is installed locally (/srv/obslight-fakeobs/) as if it had been imported from an archive. download.meego.com won't let you rsync anonymously, so unless you have a login, you won't be able to grab published binaries. The URL of the GBS you want to get project from. Example: "http://download.tizen.org/releases/2.0alpha/daily/latest/" or "rsync://download.tizen.org/snapshots/2.0alpha/common/latest/". The name of the repository target. Example: "ia32". If you don't specify repository targets, nothing will be downloaded. If you don't specify architectures, all available will be downloaded. The grab gbs command is more detailled here. check the existence of a _meta and a _config file, check if they are empty, check that there is no link to a fakeobs project in _meta. check if no RPM is missing in bootstrap (aka :full) and check for their integrity. check for the integrity of the RPMs present in the repositories. Most projects have similar RPMs in their :full and their repositories. The shrink command makes hard links between them, to save space. The -s option makes shrink create symbolic links from :full to the repositories, instead of hard links. After you have imported a project from an OBS, you can make an archive of it. You may want to shrink the project before exporting it. After that you can find a big archive in current directory named after the project (with ':' replaced by '_'). Note: you have to do this only once. All fakeobs projects will be used through the same link. After you have imported a project, it has been added as a pre-configured build target. On the OBS web UI, go to the project you want to build, follow Repositories -> Add repositories and you should see the project you have imported under fakeobs distributions. Starting from fakeobs 0.6 and OBS Light 0.5.3, you can build packages from your fakeobs projects in OBS Light. Note that these parameters are pre-configured in OBS Light GUI wizard as fakeobs.local. There is a basic web UI on port 8000, which allows to browse projects, packages, and package files. There are some parameters that you can customize in /etc/obslight-fakeobs.conf, which are self-documented. Default configuration should be suitable for most usages. for each project/release you want to convert. After checking that everything works as expected, you can remove the old fakeobs directory (/srv/fakeobs). The following is the recommended procedure for OBS project managers who want to distribute projects to their customers, using Fake OBS. Instead of re-exporting an archive, he starts an rsync daemon on /srv/obslight-fakeobs. Note that you can add this URL in /srv/obslight-fakeobs/projects/My:OBS:Project/project_info, field rsync_update_url, to avoid passing -r argument. Where are fakeobs data stored ? fakeobs data are stored in /srv/obslight-fakeobs and its subdirectories. The daemon log file is /var/log/fakeobs.log. On which port does fakeobs API listen ? fakeobs API listens on port 8001. You can test if it is running by calling http://obslightserver:8001/public/source/ in your web browser (replace obslightserver by the appropriate hostname). If you see "Unable to connect", the daemon is probably stopped. Try "service fakeobs start". On which port are published the package repositories ? The package repositories are published on port 8002. Where can I find fakeobs projects archives ? Some archives for Tizen are available at http://tizen.fridu.net. This page was last modified on 6 December 2012, at 12:55.